On a whim I picked this up off the stand at our local library. It looked interesting to me since I love survival stories. Well, I certainly wasn’t disappointed with this one. 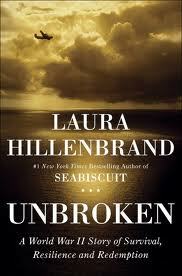 But it’s not just a survival story – it’s the epic story of Louis Zamperini. He rises from being a delinquent to competing in the Berlin Olympics. That story alone was worthy of a book. Then, joining the military in WW2 he survives a crash into the Pacific, a record long survival on an inflatable raft. And by then I thought it would all be downhill from there when he got picked up. But Zamperini was imprisoned as a POW and transferred from one tortuous camp to the next. At times it was just unbearable to read as he and others experience diabolical tortures that could only come from the pit of Hell. Finally, the war is over, and Louis has survived. And just when you think it’s all roses Zamperini goes straight down into alcohol, depression, despair. The tortures continue every night for years in his dreams. And then the greatest triumph of this story comes in the last part of the book – he attends a Billy Graham Crusade in southern California and gives his life to Christ. He forgives his tormentors and is freed forever from his past. He is able to return to Japan, forgive the very men who tortured him and live a totally free man. What a victory! I was really amazed by this story simply because I hadn’t heard of this war hero (do I lead a sheltered life?). I had no idea how it would turn out. I didn’t expect a conversion to Christ, that’s for sure. And so to see this man forgive so much reminds me of Jesus forgiving those who crucified him. This story is ultimately not about survival, or about justice, but about forgiveness.